Last March, I went to an excellent presentation at FLAG by Lee Burson and Erin Smith called “Halls, Walls, and Using it All.” The presentation was all about creative ways to utilize your available space, getting students up and moving around. So here’s an activity I learned from them called four corners: basically, you just need four categories, and four separate physical areas – corners, walls, whatever. Label the areas, call out a word or phrase, and students decide which category it fits in, and move to that area. So, for example, my categories today were Soy, No Soy, Tengo, and No Tengo (I am, I’m not, I have, I don’t have). I call out a word or phrase in Spanish (blonde hair, artistic, lazy, brown eyes) and then direct my students to physically move to the appropriate area. After they sort themselves out, I have each group repeat the phrase – I have blonde hair/I don’t have blonde hair, I’m artistic/I’m not artistic. 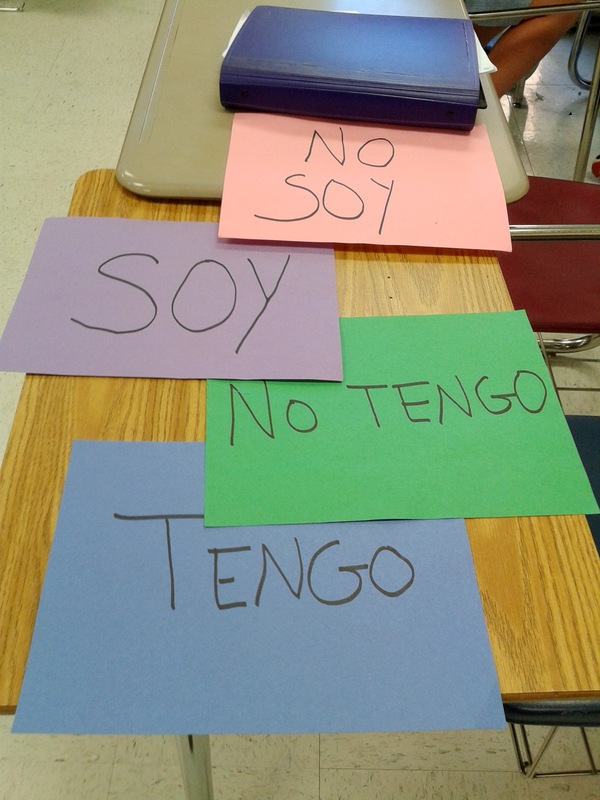 Provide lots of comprehensible input for where to put the no – I want no soy and no tengo to just sound right, so I don’t get Tengo no lentes or Soy no alto on speaking or writing assessments. Do it in the hall with the signs taped up to the wall, or take it outside on a pretty day and let student volunteers hold the signs. Alone, with my family, with my friends – maybe for working verb forms, ask Who do you ____ with? And the sentences could be, I study alone. My friends and I go to school together. My family and I watch TV together. You could indicate other groups or individuals to get in the he/she and they forms. Make it simpler: If you have TPR-able vocab, you can do this at the beginning of the unit and support comprehension of the phrases you call out by doing the gesture. You could also use picture cards to support comprehension (rather than clarifying in English) if the vocabulary doesn’t lend well to gesturing. This entry was posted in Class Activities, Sp 1 Unit 2: Who am I? and tagged descriptions, listening activities, low prep, Spanish 1. Bookmark the permalink. 13 Responses to Four Corners: Take vocabulary practice out of the classroom! Small world – I was at that presentation, too! It was a great one. Wonderful ideas! I love this vocab game, it’s a variation of the one I do with numbers for the lower grades. The students win when they go to the right area, they love it, & clap each time! I really like your idea! I’m going to flip it and use it for my ESL students to learn English! Thanks for this simple, yet effective way to practice speaking the language. Thanks. It is a simple idea but the students will like it. tengo 89 freshmen. voy a tener que pensar esto. I would lose them outside la sala de clase. It sounds super fun!! I will try it tomorrow! I use a similar game in my middle school French classes but I ask a few students to be ” liars” so that everyone doesn’t just mindlessly follow the crowd but actually thinks about where to go. At the end of the class we guess who the ” liars” were and there are bragging rights for those who guess correctly.